The brown-headed nuthatch (Sitta pusilla) and the pygmy nuthatch (Sitta pygmaea) both descend from a common ancestor that used to range all across the North American continent. Now, the former inhabits the southeast, while the latter lives in disjunct populations scattered across the southwest. They are similar in size, appearance, and habitat preference. The pygmy nuthatch has a darker brown cap than the brown-headed nuthatch, and its tail has white spots not found on its cousin, but otherwise they are physically identical. Both favor mature pine forests prone to frequent fire. Brown-headed nuthatch in its usual position, perched upside down on a tree trunk. They live in mature southern pine forests and originally were abundant in long leaf pine savannahs. Range map of a brown-headed nuthatch. I suspect the average abundance figures on this map are misleading. They are probably more abundant on the coastal plain than the piedmont, but more people live in the piedmont and report seeing them there. Pygmy nuthatches live in Ponderosa pine forests out west. Range map of the pygmy nuthatch. Fossil evidence of a small forest-dwelling bird, such as a nuthatch, is understandably scarce, yet does exist. The oldest fossil specimen from the Sitta genus dates to early in the Miocene (~23 million years ago) and was excavated in France. In North America 2 specimens of nuthatches dating to the middle Pleistocene (~600,000 BP) were found in Porcupine Cave, Colorado. One was positively identified as the still extant white-breasted nuthatch (Sitta carolinensis). Brown-headed nuthatches and pygmy nuthatches became geographically isolated from each other during the latter stages of the Pleistocene. A desert scrub and grassland corridor existed during the early and middle Pleistocene that linked southeastern North America with the west. During some undetermined time in the mid to late Pleistocene ecological changes closed this pathway for some species. Like burrowing owls and Florida scrub jays, brown-headed nuthatches became isolated from their western populations. In the cases of the jays and the nuthatches, speciation occurred between the eastern and western populations. As far as I know, no attempt has ever been made to see if these 2 species of nuthatches would interbreed in captivity. I bet they could. Ponderosa pine forests were reduced to 2 refuges durng the Last Glacial Maximum when they were displaced by spruce forests. Studies of pygmy nuthatch genetics suggests they only survived in 1 of the refuges. Nuthatches are smart birds that use chips of bark to probe for insects burrowing in wood. Seeds are also an important part of their diet. Family groups usually consist of a male, female, and a male offspring who helps take care of the nestlings. The annual survival rate is about 70%. The brown-headed nuthatch has an outlying population in the Bahamas where it lives in Carribbean pine forests. Prospects for survival there are doubtful because developers are going to eliminate all of the pine forests, none of which are protected by nature preserves. I was 4 years old when my mom first tried telling me about Santa Claus. I went directly to the chimney, looked inside, and told my mom there was no way a fat man in a red suit could fit in there. I admit that I was precocious. When my daughter was in 3rd grade, she told me the kids in her class had a big debate over the true existence of Santa Claus. But by 4th grade most kids have it figured out. It’s too bad more adults don’t employ the critical and logical thinking I demonstrated when I was a pre-schooler, and that most kids can manage by the time they are 9. The skeptical Santa. For Christmas I present to my readers the truth and facts that seem to be absent in today’s cable television news and entertainment shows. Bigfoot is a man in an ape suit. Cryptozoologists think bigfoot may be Gigantopithecus blacki, a species thought to be extinct. Cryptozoologists believe it is still surviving in North America. Gigantopithicus was an ape closely related to the extant orangutan. In other words it was a giant orangutan. It was the largest known primate to ever live on earth. The genus originally evolved 9 million years ago but no fossils younger than 300,000 years have ever been found. The only fossil evidence we have consists of 3 lower jaws and 1300 teeth. Based on the size of the jaws and teeth, scientists estimate it was 10 feet tall and weighed 1200 pounds. All of the fossil evidence has been excavated from sites in China and Vietnam. None come from North America. The dentition suggests it was dependent upon bamboo for sustenance. A reconstruction of the extinct Gigantopithecus blacki. It was quite a beast. The reconstruction of this species is also quite a stretch–no limb bones nor skull of this species have ever been found. It co-existed with Homo erectus for at least 500,000 years. A viable breeding population of a species this large in North America could not exist unknown to modern science, especially in this day and age of trailcams and satellite and aerial photography. The impressions of the feet are easily faked. Moreover, a big ape like Gigantopithicus was a knuckle-walker and wouldn’t leave footprints such as those that are faked. It is obvious that Bigfoot is a hoax. Bigfoot is a man in an apesuit. This famous photo is actually a Hollywood stuntman in an ape suit. And here’s the man, Bob Heironimus, along with the suit that fooled so many gullible people. Bob Heironimus admitted that he was the one in the apesuit in the famous film frequently shown on television. He passed a lie detector test. The latest hoax about Bigfoot comes from a veterinarian who claims she has DNA evidence of a man-ape hybrid. Her results haven’t been published in a peer-reviewed journal. Don’t hold your breath. There will never be a zombie apocalypse–it is not physiologically possible. Zombies have become popular fodder for fiction recently. I like to watch those tv shows and movies and read those books too, but the Discovery Network sunk to a new low last week when they aired a special supposing what would happen, if there was a real zombie apocalypse. They had scientists proposing that a virus could actually cause zombie-like symptoms. No way. There is no virus that can re-animate a person. In fact, there is no viable scientific explanation for reanimation. Zombies are a subject of supernatural horror, not realistic science fiction. Supposedly, zombies don’t breathe, nor do they have circulating blood. Yet somehow, they can walk, use their senses to detect where potential prey is located, and attack and eat. This is not biologically possible. Without oxygen human muscles will not work and no brain function whatsoever is possible. Just watch an MMA fight. On occasion an MMA fighter will get caught in a sleeper hold. Usually it takes less than a minute of asphyxiation to cause them to lose conciousness. Zombies never breathe, yet they can move their muscles indefinitely. There is a general lack of logic in zombie fiction as well. Supposedly, there are endless masses of people who have become zombies. This is simply an excuse to show violence, as survivors kill this infinite supply of zombies. An endless swarm of zombies is not logical. Look outside. How many people do you see walking in the street right now? I see no one. The vast majority of people would turn into zombies while they were inside houses, buildings, hospitals, and cars. There would be no mass swarmings of zombies. They would be trapped inside, unable to get out because, according to zombie literature, they can’t turn door handles (though they can detect prey). The survivors in zombie apocalypse fiction always choose to do the exact opposite of what a logical person would do. I’d head for Cumberland Island where there are no people and no bridges that would enable zombies to cross the intracoastal waterway. But instead, these fictional survivors always head toward prisons, hospitals, army bases, and malls–where there would be lots of zombies. The whole premise of a zombie apocalypse is totally illogical. Religion is a business scam that should be taxed. There is an organization that has gone to court to try and end the IRS rule prohibiting political speeches in churches. Endorsing a political candidate can endanger a church’s tax exempt status. I agree with this organization–they should be allowed to endorse candidates. But they should be taxed anyway because all religions are nothing more than a business scam. Religions make money by promoting lies invented by a bunch of old men beginning about 2,700 years ago. Preachers, priests, and rabbis all profit from brainwashing people into believing archaic myths. I don’t know if there is a God or not but I know he’s not an invisible Jewish rabbi who let himself be tortured to death, so he could die for everybody’s sins, then reanimate like a zombie for a few days before ascending to heaven to sit next to himself. If that sounds mixed up and illogical, realize I’m only restating in different words what the bible claims. Anybody who takes the bible seriously is more gullible than people who believe in the existence of bigfoot. Patches on foot soles can not detoxify heavy metals from the human body. Not long ago, I saw a commercial on some late night cable for a product that supposedly could detoxify heavy metals from the human body. It was a patch, not unlike gauze, placed on foot soles. I rolled on the floor laughing at this absurdity. Less than a month after they began showing this commercial, I read the FDA had ordered this company to stop making this unproved claim. I wonder how many gullible souls wasted money on that joke. The NRA is a terrorist organization. The National Rifle Association is a terrorist organization. Every year, guns kill more people in the U.S. over a 4 month timespan than the terrorists did on 9-11. All of the NRA’s arguments against gun control are illogical and lack critical thought. Here I debunk each one. Yeah, but people using guns kill an average of 10,000 people a year in the U.S. It’s a lot easier to pull a trigger than to manually have to stab someone with a knife or hit someone with a baseball bat. Guns are more effective too. There is no way a man with a knife could have killed 20 schoolchildren and 6 teachers at the Newtown, CT. school. Someone would have been able to physically stop the wimp and probably before he killed anyone. This argument is simply a lie. The police will still have guns. Are the police outlaws? This is the stupidest argument of all. The purpose of a car is transportation. The purpose of a gun is killing. As the lyric to the Lynyrd Skynyrd song “Saturday Night Special” goes, “Handguns are made for killing. They ain’t no good for nothing else.” We need cars to survive in the modern world we live in. We don’t need guns to survive. Gun owners are over 4 times more likely than non-gun owners to die from gunshot wounds. Two armed policeman were present at the Columbine School shooting. They could not stop it. Before talking about gun control, every politician, even those favoring tougher regulations, always have to make the statement that they support the 2nd amendment. That shows how much the NRA terrorizes our politicians. Stating support for the 2nd amendment is nonsensical because the 2nd amendment is poorly written and ambiguous. From the way the 2nd amendment is written, it is impossible to determine whether the founding fathers meant gun ownership was a collective or an individual right. The founding fathers used plural words such as “militia” and “people” when referrring to gun rights. One could make the argument that gun ownership is merely a collective right, not an individual right. The 2nd amendment does not use the word “both,” debunking the claim that it protects both the collective and individual right to own guns. Moreover, all they had then were single shot muskets and pistols. If these gun rights nuts want to take a strict interpetation of the constitution, the only guns that should be legal are single shot muskets and pistols. That ban was too weak and not strictly enforced, but that’s beside the point. We have laws against murder, but that doesn’t stop murder. According to the NRA’s logic, we should legalize murder because laws against it don’t work. The majority of people in this country believe God is an invisible rabbi who sees all, and many also believe in the existence of bigfoot and angels, the possibility of a zombie apocalypse, and that patches on foot soles can detoxify heavy metals. Most are in huge credit card debt. Americans are not a responsible rational people. In response to the Newtown shootings Senator Jay Rockefeller wants the National Academy of Science to study violent video games. Rockefeller is too cowardly to attack the real cause of the violence in America– the availability of handguns and assault rifles. Instead, he wants to scapegoat video games because it’s much easier than taking on the terrorist organization known as the National Rifle Organization. Hey Jay–it wasn’t video games that killed 20 schoolchildren in Newtown…it was assault rifles. Gun control proponents are wrong about one thing. They claim there is no hunting use for rifles with high capacity magazines. Rednecks in Texas like to shoot into herds of feral hogs with these weapons. Here’s Ted Nugent using a machine gun to shoot into a herd of feral hogs from a helicopter. Not exactly sporting either. Ted Nugent is a sadistic howling maniac. In my opinion all assault rifles and handguns should be outlawed. Gun deaths in the U.S. are 20 times higher than the average rate in the rest of the developed world. The only legal firearms should be single shot rifles and shotguns for hunting. A single shot firearm still gives an unfair advantage to man over beast, but at least it’s not the glorified slaughter as depicted in the above photo. Every year, I gather persimmons from a tree growing on a narrow strip of land between an expressway and a mall parking lot. I know enough to wait until early December before I harvest the fruit. Though a few varieties do ripen as early as mid-September, most don’t bear ripe fruit until winter. Many people unfairly dismiss persimmons because they’ve eaten unripe ones. The tannic acid in an unripe persimmon gives a person the feeling of having a mouth full of cotton. Persimmons look ripe to the unpracticed eye for several months before they are actually good to eat. They must be soft and mushy to touch before one knows the sugar has replaced all the tannic acid. The ripening process has nothing to do with frost, but rather length of exposure to sunlight. They need so many hours of sunlight to ripen that they usually aren’t ready to eat until after the first frost. I picked about 3 pounds. I picked these on December 1st. The fruit on the tree growing next to this one was still not ripe. I had another photo I wanted to use, but decided not to post it because I didn’t realize my checkbook was in the background. I didn’t think it was a good idea to have my account number on the internet. Persimmons are very sweet and to me taste like perfumed dates. I simply pop them in my mouth and spit out the seeds. They are one of the most nutritious fruits in the world. The food value of this fruit attracts many species of mammals including fox, possum, raccoon, and bear. Possum eating persimmon. They don’t swallow the seed and are not good dispersers of the fruit. Raccoon reaching for persimmon. They do swallow the seeds and are good dispersers for the fruit. Possums are famous for loving persimmons, but they are not effective dispersers of the seed. One study proved that possums rarely swallow the seed. In this experiment possums were given 63 persimmons and only 1 seed was ingested. Raccoons, foxes, and bears are better dispersers of the fruit because they do swallow the seeds and scatter them in their scats. Another study found that persimmons were a favorite food of raccoons. Raccoons chose persimmons over corn, crayfish, eggs, earthworms and 5 other items. Persimmons are considered only slightly anachronistic, unlike pawpaws, honey locust, and osage orange–3 plants that were entirely dependent on extinct megafauna for dispersal. A mastodon likely gobbled down persimmons by the hundreds and spread them all over the landscape. Persimmons have been found in mastodon dung excavated from the Aucilla River in Florida. The tree can resprout vegetatively, so they could have withstood heavy proboscidean pruning. However, persimmons are still common and not local in distribution like other more anachronistic species. In abandoned fields in Georgia persimmon is almost as common loblolly pine, oak, and sweetgum–the pioneer trees of early forest succession here. A large species of African persimmon is entirely dependent upon elephants for dispersal. The fruit is also eaten by chimpanzees and gorillas, but the seeds are too large for them to swallow. Only elephants are big enough to swallow the seeds of this species. Elephants are the sole disperser of a large species of African persimmon. Here’s Euell Gibbons’ recipe for persimmon bread. It is excellent and I make it every year. Beat 1 and 1/2 sticks of softened butter with 1 cup of sugar. Add 1 cup of persimmon pulp and 2 beaten eggs, and 1/2 cup of chopped nuts. Add 2 cups of bread flour and 1 teaspoon of baking powder. No liquid is required. Spoon the batter in a well-greased loaf pan and bake for 1 hour at 325 degrees. It is tedious to separate the seeds from the pulp. It takes about 40 wild persimmons to equal 1 cup of pulp. I don’t even bother removing the skins, and a few seeds always end up in the bread. It would be convenient to find a female persimmon tree that was left unfertilized. Unfertilized female persimmon trees bear seedless persimmons. I know of a persimmon tree that bears seedless persimmons, but it grows on an island in Woodbridge Lake in Evans, Georgia and is only accessible via canoe. The lake must isolate it from pollination. Grocery store persimmons come from female trees that are commercially grown in isolation from male trees. They are all seedless, but I can’t bring myself to pay money for a fruit I can obtain for free. 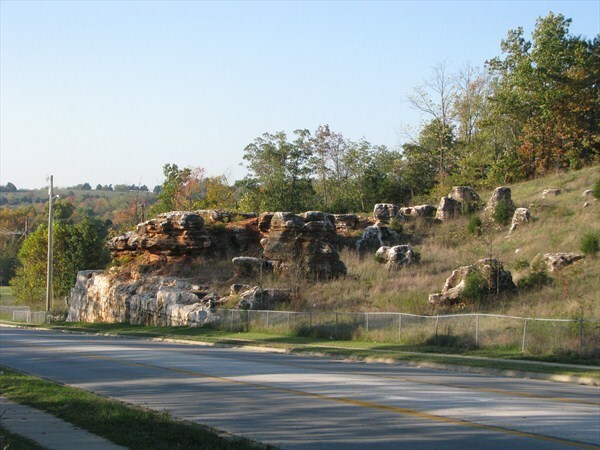 The terrorist attacks on September 11, 2001 overshadowed the discovery of a remarkable fossil site in southeastern Missouri that occurred on that very day when a road-building crew uncovered Riverbluff Cave. This cave is 220 feet long and the fossiliferous Pleistocene-age sediments were 18 feet thick. On the first day of discovery workers found 15 foot high claw marks made by the extinct giant short-faced bear (Arctodus simus). I posted a photo of those marks on the blog entry just previous to this one. The cave is now closed to the public and only scientists with permits are allowed to study inside, though there is a public museum dedicated to the find. Riverbluff Cave, Missouri. The cave is closed to the public. It’s a beautiful rock outcropping. Fossils apparently began accumulating in Riverbluff Cave about 970,000 BP. The fossil deposition lasted until 55,000 BP when a rockfall sealed the cave. Scientists found mammoth bones dating to 660,000 BP here. The website for the Riverbluff Cave Museum erroneously reports this as the oldest mammoth fossils found in North America. This claim is not even close. Mammoth fossils dating to 1.36 million years ago were found in Bruneau, Idaho 60 years ago, and I think there have been mammoth fossils found in Florida that are older than that. This early mammoth species is known as the southern mammoth (Mammuthus meridionalis). However, Riverbluff Cave does have some unique features found nowhere else. Scientists found 25 beds scratched out by bears that formerly denned here. This is also the only place in the world where tracks of the extinct flat-headed peccary (Platygonus compressus) are still intact. Strange as it may seem, fossil millipedes dating to the Pleistocene were unknown from that era until they were discovered here. In addition to these unusual features, the cave offers scientists a mountain of data, including bear and peccary coprolites, hair from extinct mammals, and scores of bones from large and small mammals, birds, reptiles, and amphibians. 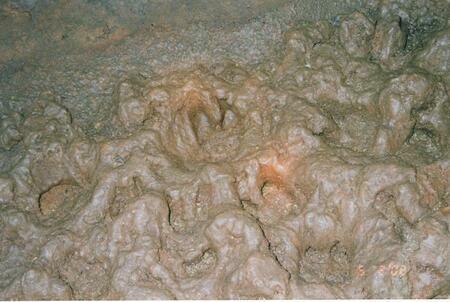 Plus, the rocks forming the surface of the cave contain Paleozoic echinoderm (starfish) fossils. 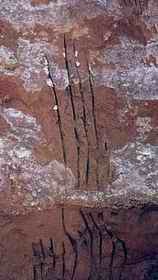 Claw mark made by an extinct species of lion–Panthera atrox. Hoof marks made by flat-headed peccaries. There used to be 6 springs on a Pomme de Terre River terrace in southwestern Missouri before construction of a dam flooded them. Luckily, scientists were able to study each in detail in advance. These springs acted as bogs that attracted and preserved many species of animals but especially semi-aquatic mastodons whose remains were so abundant that scientists could thoroughly study changes in their anatomy over time from specimens excavated here. Pollen, plant, and animal fossils accumulated in Jones Spring beginning 75,000 BP and lasting until the present, providing an almost continuous ecological record. During the middle of the Wisconsinian Ice Age, a warm interstadial allowed hardwood forests to flourish on rich soils, while jack pine predominated on thin and sandy soils in this region. Jack pine no longer occurs south of Michigan. Macrofossils of oak, maple, dogwood, plum, cherry, elm, hickory, honey locust, osage orange, ash, juniper, and jack pine were excavated from Jones Spring. Pollen indicates an environment of 20%-30% pine, 10% oak, 5% grass, 5% composities, 5% ragweed, and 35% other plants. This composition of species suggests an environment prone to frequent fire. Osage orange and honey locust, not coincidentally, bore fruit dependent on mastodons for propagation, explaining their abundance here. Later, as the climate cooled, spruce forests replaced the oak and pine woodlands, but by the latter stages of the Ice Age, oak and other hardwoods began to recolonize the region, and they co-existed with spruce in forests that have no modern analogue. Jack pine never recolonized the region, demonstrating the haphazard nature of plant distribution. Vertebrate fossils found here included mastodon, mammoth, Harlan’s ground sloth, camel, horse, donkey, tapir, long-horned bison, woodland musk-ox, saber-tooth, raccoon, ducks, alligator, and box turtle. The presence of alligator, which no longer ranges this far north, may be evidence of warmer winters during the mid-Wisconsinian interstadial than occur here today. However, it’s possible alligators simply haven’t recolonized the region since the LGM. There were 2 Trollinger Springs. The remains of at least 15 mastodons were excavated from these springs in addition to woodland musk-ox and stilt legged deer (Sangamona fugitiva). Koch Spring was excavated in 1843, but most, if not all the fossils, were shipped to European museums and are now lost. Jeffrey Saunders posing behind some mammoth bones found at Boney Spring, Missouri. He co-authored one of my most favorite scientific papers I’ve ever read. From data they analyzed that came from 6 springs on the Pomme de Terre river terrace, they were able to reconstruct what the environment was like during the mid to late Wisconsinian Ice Age in Missouri. Fossils from Boney Spring date to the LGM. This spring hosted the greatest variety of animal fossils found in all the springs. Scientists even found seed shrimp and insect fossils in Boney Spring. One of the insect species (Ocophora) is a boreal rove beetle that no longer occurs this far south. Scientists catalogued the bones from 2 species of fish, 4 of amphibians, and 7 of reptiles. Many small mammals left fossil evidence at Boney Spring–fox squirrels, woodchucks, flying squirrels, chipmunks, gophers, and bog lemmings. Larger mammals such as giant beaver, Harlan’s ground sloth, horse, tapir, and white tail deer left bones here as well. The remains of at least 31 mastodons rested here until they were excavated prior to reservoir inundation. Pollen from one of the mastodon tusks contained 26%-30% spruce, but also substantial amounts of oak, willow, alder, elm, and tulip. This particular mastodon must have died during the latter stages of the Ice Age when hardwoods were recolonizing the land from spruce forests. Truman Lake now covers those amazing springs where so much paleoecological information was gleaned. With a massive presence and a terrifying roar Arctotherium angustidens rampaged over South America about 2 million years ago, chasing frightened predators away from their kills and gorging itself on the scavenged meat. These giant bears reached a weight of 3500 pounds, so to sustain this bulk, they needed to eat approximately 50 pounds of meat per day. They occasionally captured wounded or sick prey animals, and they likely consumed some vegetable matter, but their primary survival strategy was “kleptoscavenging.” Like their distant North American cousins, the giant short-faced bear (Arctodus simus), Arctotheriums trotted long distances, covering grand territories, and with their keen sense of smell they could detect the scent of blood from miles away. They followed their nose to the source and used their great size to intimidate big cats, wolves, and terror birds from the meat those successful carnivores had worked so hard to procure. Size comparison between Arctotherium angustidens and Homo sapiens. This was probably the biggest species of bear in earth’s history. The bones of an old male Arctotherium were discovered in 1935 during the construction of an hospital in La Plata, Argentina. The skeleton was not described in the scientific literature until 2010. The scientists re-examing the specimen determined the individual suffered and recovered from several injuries, likely incurred from battling other male bears. The old bear also had arthritis. From the bones they estimated a mass of 3500 pounds. By about 800,000 BP Arctotherium angistidens no longer occurs in the fossil record. Some scientists suggest it became extinct due to competition from other predators, but I disagree with this notion. Instead, I think they evolved into a more herbivorous bear because of environmental changes. A large “kleptoscavenger,” like Arctotherium, can only survive in an environment with abundant prey animals and predators. Grasslands can support this kind of biomass, but forests don’t. I propose that cyclical climatic conditions caused South American grasslands to convert to woodlands. Arctotherium angistidens was forced to eat more vegetable matter in this woodland environment and eventually evolved into different species, culminating in Arctotherium wingei. The latter species was as herbivorous as its distant cousin, the still extant spectacled bear (Tremarctos ornatus) and was adapted to live in a similar forested environment, until it went extinct at the end of the Pleistocene. Bears, cats, and wolves invaded South America when the Central American landbridge rose above sea level 3 million years ago. The South American versions of bears and saber-tooths initially grew larger than their North American cousins, perhaps because prey animals were larger and slower here. Arctotherium was in the same family as the North American short-faced bears which included the giant short-faced bear (Arctodus simus), the lesser short-faced bear (Arctodus pristinus), and the Florida spectacled bear (Tremarctos floridanus). The lesser short-faced bear was probably ancestral to the giant short-faced bear. The giant short-faced bear was mostly carnivorous but ate some plant matter, while the spectacled bear was mostly herbivorous but ate some animal matter. A. pristinus was more of an omnivore than the other 2 species. Fossils of the giant short-faced bear and the spectacled bear have been found at late Pleistocene sites in southeastern North America, but the latter is far more abundant. Photo from a 1960 issue of Sports Illustrated of the hunter standing next to the taxidermic mount of the biggest wild polar bear ever recorded. He shot and killed it in Alaska. It weighed 2210 pounds. This was about the average size of the extinct giant short-faced bear. Scrape marks on the side of Riverbluff Cave, Missouri. They are 15 feet high and were made by the giant short-faced bear. The bear stood 12 feet tall on its back legs and must have reached up with its arms over its head to reach that height. Size comparison between the giant short-faced bear and a Yellowstone grizzly. As the top above photo shows, the largest wild polar bear ever recorded was shot in Alaska in 1960. It weighed 2210 pounds. This was only slightly larger than an average male giant short-faced bear. I’m sure a few individuals of the latter species exceeeded that size. They reached that great size from a combination of genetics and a high protein diet. Scientists estimated the giant short-faced bear required 35 pounds of meat everyday. In environments with fewer prey animals, they may not have reached a particularly large size. Grizzly bears (Ursus arctos) are the exact same species as the Kodiak bear. The former average about 500 pounds, yet the latter reach weights of 1500 pounds. Kodiak brown bears enjoy a high protein diet rich in salmon, while grizzly bears are forced to survive on roots, berries, rodents, and only the occasional scavenged kill. A Yellowstone grizzly cub, if moved to Kodiak Island, would probably grow much larger on a diet of all the salmon it could eat than it would if it stayed in Yellowstone. The largest brown bear in captivity grew to 2100 pounds–a mass equal to the average weight of a giant short-faced bear. This bear had a more favorable diet in its zoo environment than it would have in the wild. In 2000 workers widening route #75 in northeastern Tennessee discovered fossiliferous black soil dissimilar to the red clay dirt commonly found in most of the surrounding countryside. The highway engineer called in the scientists who soon realized the site was an astonishing treasure of Miocene-age plant and animal fossils. From the great amount of data they began uncovering, they knew they could theoretically reconstruct what the entire ecosystem was like then. The state of Tennessee, home of the infamous and embarrassing Scopes Monkey Trial, took the commendable action of rerouting the highway. Moreover, in conjunction with East Tennessee State University they built a museum directly adjacent to the site, and now ETSU hosts one of the top paleontology programs in the nation. Aerial view of the Gray Fossil Site in Tennessee. I almost visited this museum when I went on my trip to Roan Mountain Bald a few years ago, but I decided not to drag my wife and daughter to yet another museum. The Gray Fossil Site consists of 2 and probably more filled-in sinkholes. One sinkhole dates to the late Miocene/early Pliocene (about 7 million-4.5 million years ago), while the other dates to the late Paleocene/early Eocene (about 55 million years ago). The sinkhole with the Miocene age vertebrate and plant fossils is 220 meters long by 100 meters wide by 36 meters deep. In ancient times it was a deep but small pond that formed when rainwater caused underlying limestone bedrock to dissolve away. The structure of the deep sinkhole meant a lot of plant material accumulated on the bottom, creating a poorly oxygenated aquatic environment that prevented the vertebrate bones and plants from decomposing. Later, the pond filled with sediment, preserving the remains until their discovery a little over a decade ago. To date only 2% of the site has been excavated, yet over 15,000 fossils have been found here. There is no radiometrically datable rock at the site, so scientists were forced to use index fossils to estimate the age of the site, explaining the lack of precise dating. Scientists know the hippo-like rhino (Teleoceras) became extinct about 4.5 million years ago because no specimens of this species have been found at sites younger than that. A species of short-faced bear (Plionarctos) is unknown from sites older than 7 million years. These other sites do have radiometrically datable rock. Thus, that’s the reason for the bracketed dates of age estimation for this site. The abundance of sticks, acorns, nuts, leaves, pollen, ostracods, snails, and charcoal found at the Gray Fossil Site makes scientists about as excited as the rich assortment of vertebrate bones. From all this data they can reconstruct a relatively accurate picture of the entire environment here. One scientist even studied the varves and sediment accumulation patterns to estimate what the climate was like during the late Miocene. The North American continent during the Miocene, though recognizable to modern geography students, was quite different than that of today. Most importantly, the Isthmus of Panama had yet to rise above sea level and North and South America were not connected by a landbridge. Moreover, much of the Rocky Mountains had yet to form. An important ocean current existed between the 2 continents, and it played a major role in the climate. The modern Gulf Stream current that keeps the North Atlantic waters warm didn’t exist yet. Ironically, the Atlantic Ocean was cooler than it is today, but the continents were warmer. This dramatic difference in temperature between land and ocean caused frequent monsoons during the wet season, but evidence from sediment accumulation suggest the wet monsoon season alternated with a dry, drought-like summer. However, the climate was stable for millions of years–the continents had yet to drift into the positions that caused cyclical Ice Ages to occur. Most of North America was tropical or subtropical and frosts at the Gray Fossil Site then were rare to nonexistent. A temperate forest zone with winter frosts was restricted to northern Canada. Ocean currents were different before the Isthmus of Panama rose above sea level. Continental drift eventually joined North and South America, changing worldwide oceanic currents. This in addition to the collision of India with Asia causing the rise of the Himalayas; and the North American subduction events forming some of the Rocky Mountains contributed to the beginning of Ice Ages. The Miocene forests formed a continous somewhat homogenous environment all the way across North America, Beringia, and Asia. Many of the species in Asia and North America were similar and closely related, if not the same. Palynological studies of the sediment at the Gray Fossil Site show that pine, oak, and hickory made up 90% of the pollen, not unlike that of today’s environment. Other common plants included elm, sweetgum, fir, hemlock, walnut, asters (flowers such as sunflowers), and chenopods (spinach, beets, lambquarters, quinoa, etc.). Macrosfossils of grapes, moonseed, and bamboo show these species were abundant, though the pollen from these plants doesn’t even show up in the pollen analysis. Many of the species of pine and oak were probably different from extant species. But the Tennessee State website about the site has a slideshow of Gray site fossils including leaf impressions, and I recognized post oak and southern red oak–2 common species still found in the region. However, they may have been adapted to different climatic conditions, and if a viable acorn was planted from one of these trees (not likely possible of course), it might struggle to survive in the modern environment because these species have evolved since then to survive in a summer hot/winter cold climate quite different from the Miocene wet/dry seasons with no subfreezing temperatures. Abundant charcoal and the presence of fossil giant bamboo cane (a fire dependent species) from the site suggests frequent forest fires. Along with windstorms, this created an environment consisting of a mix of closed and open forests around the sinkhole pond. Another sinkhole at the site yields botanical evidence of an early Eocene environment. The area then was dominated by pine, beech, walnut, and aster; though most, if not all, were completely extinct species. The largest species of mammal to fall into the sinkhole was the gompothere–an elephant-like animal more closely related to the mastodon than the mammoth. A nearly complete skeleton of a Teleoceras, the hippo-like rhino, was found here. This very likely was the second largest mammal living in the environment here. Teleoceras, the hippo-like rhino. A nearly complete skeleton was found at the Gray Fossil Site. It was an aquatic species. A 14 foot tall camel browsed in the Miocene forests. This giraffe-like animal is known as Megatylopus, and it must have been able to reach leaves and twigs that rhinos, horses, and tapirs couldn’t reach. Portrait of a Megatylopus drawn by Debbie Kaspari. What a spectacular beast. At least 1 species of giant ground sloth occurred here. Ground sloths originated in South America but found their way to North America millions of years before the Isthmus of Panama rose above sea level. Scientists think they arrived via a combination of swimming and island-hopping. By far the most common large animal found at the site is the dwarf tapir (Tapirus polkensis). Scientists have excavated over 80, a total that surpasses the amount of fossil tapir material found at any other site in the world. The dwarf tapir was closely related to Baird’s tapir, a species that lives in Central America today. Photo of Baird’s tapir and young. This is a Central American species of tapir and the closest living relative to the extinct dwarf tapir (Tapirus polkensis) that was the most common large mammal living in northeastern Tennessee about 5 million years ago. Three-toed horses were also common, occupying a niche that whitetail deer do today. They were slenderly built, more like a deer than a horse. A species of peccary closely related to the modern collared peccary was a component of the fauna. It was evidentally not related to the long-nosed and flat-headed peccaries–the species that were common in North America during the Pleistocene. Collared peccaries also expanded their range during warm interglacials of the Pleistocene, but were absent from much of this territory during stadials. I was surprised to discover that deer were not on the list of species found here. This forested habitat would have been ideal for them. I contacted a paleontologist who works at the site and noted the lack of deer fossils. He told me they had discovered a few deer fossils, but they were rare and undescribed in the scientific literature. He referred me to another paleontologist who would know more about it, but that guy informed me no deer fossils had been found…yet. So, it’s unclear whether deer fossils are among those found at the site. Maybe, they don’t want to officially announce the find until someone gets credit for the possible discovery of a new species. In any case, during the Miocene deer were first starting to evolve. Later, they spread throughout the northern hemisphere and ecologically replaced 3-toed horses. Only 2 species of large carnivores have been found at the site. A tooth belonging to a Machairodus is evidence a fanged cat ancestral to Smilodon and Dinobastis (the scimitar-tooth) hunted here then. Borophagus, the bone-eating dog, and hyenas would have been 2 additional large carnivores present during the Miocene, but so far, no specimens of them have been found. The other large carnivore that we know for sure lived here was Plionarctos–a species of short-faced bear that later diverged into the Pleistocene-aged vegetarian Tremarctos floridanus and the carnivorous Arctodus pristinus which then evolved into Arctodus simus. Two new species of small carnivores were discovered here. I wrote in my blog entry last week that red pandas were discovered here. I forgot to mention that this species was 4 times larger than modern day red pandas, making them about a 50 pound animal. A new species of woodland badger (Arctomeles dimolodontus) was found here as well. It was more closely related to European badgers than to the American species of badger adapted to live in prairie environments. Dipoides (a species of beaver), swam in the sinkhole pond. It was closely related to the Pleistocene giant beaver (Casteroides ohioensis), and it did build dams like modern beavers. The only extinct species of reptile found among the fossils was a type of alligator that appears to have been a transitional species between Olsen’s alligator (Alligator olseni) and the modern American alligator (Alligator mississippiensis). It was smaller than a modern alligator, growing to less than 8 feet long. It’s presence is evidence of a relatively frost free climate. Two species of alligator live in the world today–1 in southeastern North America and the other in China. Olsen’s alligator is likely the ancestor to both and formerly ranged over an expanded continous range on both continents before climatic conditions deteriorated. Other species of reptiles and amphibians found at the site are species that are still extant, demonstrating a slow rate of evolution among turtles and frogs. Skulls of Olsen’s alligator. This species was ancestral to both American and Chinese species of alligators. It’ s range was continous over both North America and Asia. You are currently browsing the GeorgiaBeforePeople blog archives for December, 2012.